The first "serious" trek was planned for Saturday - MC wanted to take us on a route which was about two and a half hours long. We were aiming to be mounted and ready to leave at about 10am, so the LSH and I headed up to the Farm a little after nine. MC was there ahead of us, but hadn't caught Pietro yet. A big revelation was that it turns out he's not called Pietro, he's called Quieto, which is very appropriate, given his even temperament! Flurry was wearing his saddlebags again, for the first time since we finished Le Big Trek. Today, they contained only water, but I had intended to bring along the Renegade Emergency Repair kit, containing the tiny allan key for adjusting boots, a spare cable and a spare strap, and a mini First-Aid kit, both of which I forgot. Oops. We headed off, leading the horses. 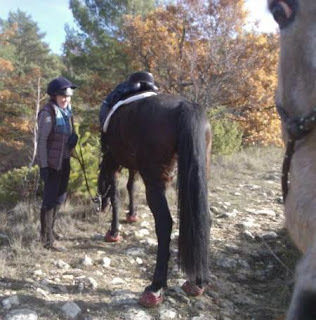 This is something I've noticed Serious French Trekkers do, and it's probably a good idea - I assume it's to allow the horse's back to warm up before we plonk our weight upon them. Is this just a French thing or does everyone do it? We agreed to mount up about five minutes out, and I was first in the saddle. Aero was very calm and relaxed, and stood like a little gent beside a rock while I hauled myself up. As I turned to follow the LSH and MC, who were aiming for a rock further down the lane, MC spotted that Flurry had pulled off a boot, so I quickly jumped off again and held Flurry while the LSH investigated. It was more serious than it appeared - both cables had been pulled out completely. At this point, I was deeply regretting not remembering the Renegade Emergency Repair kit, but lo and behold, MC pulled a teeny allen key out of her saddlebags, and herself and the LSH started repairs while I held Aero and Flurry. All was going well until they dropped the allen key and failed to find it in the grass. Enough was enough, the LSH said "This is crazy, go on without me" and we agreed, it seemed the only solution, we had already been delayed a good ten minutes by the broken boot. My heart beat a little faster though - Aero would surely get a bit wound up once Flurry left, was I setting myself up for a disastrous ride? What if we put Aero's front boots on Flurry's hind feet, then I could relax and enjoy myself on Flurry! Great idea, but no go - after another bit of boot juggling, we determined that Flurry has definitely outgrown the size 2W boots. Ok, I said, trying hard to be positive, I'll go with Aero, he really needs the trekking experience anyway. I'll be cautious and stay on foot for the first while, in case he's silly about Flurry leaving. Well, he could have cared less about Flurry leaving. There was no drama, no calling, just a little generic anxiety from time to time. Eventually, we mounted and carried on, Quieto striding along calmly in front, Aero walking behind, a little tense and anxious at first, but he soon settled, and settled really well, too. He was excellent - I was really pleased with him. 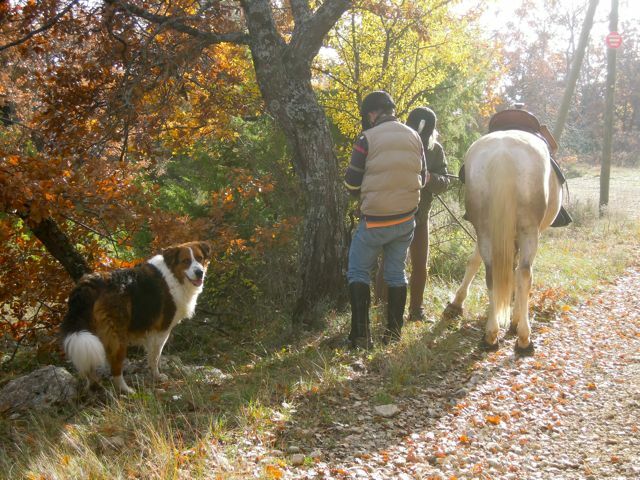 The scariest thing we met while we were in the woods was a hunting dog with a loud bell hanging from its collar - both horses were slightly alarmed, until they saw that it was just a dog. 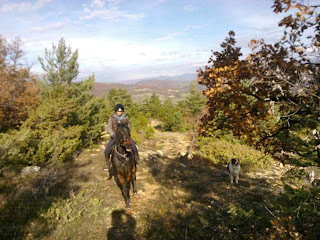 We remounted after the steep descent and rode along the valley floor, somewhere near Aubenas, I think. We trotted a couple of times, and although he was power-trotting, I didn't feel out of control. 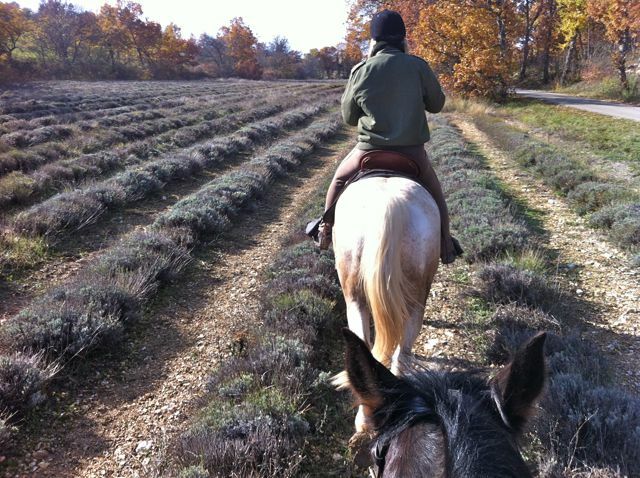 I did, however, feel incredibly uncomfortable and unbalanced in his saddle. 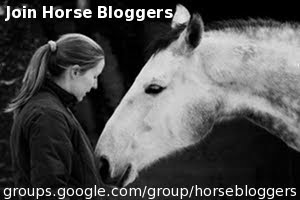 I think there will have to be a new saddle on the horizon, but that won't be until January at the very earliest. We tried Aero in front for a while, but he but got progressively more nervous and jumpy, so we came to the conclusion that his little brain was not yet ready for the responsibility of leading, so Quieto took up the lead again. We gave the horses a short break just before we tackled the last ascent. I'm pretty sure Aero knew he was near home, because he was reluctant to settle and graze, but I was surprised and horrified when he sank to his knees and started rolling - I was looking at his Isabelle Werth saddle and thinking, don't go over on it, you idiot! It may be incredibly uncomfortable, but it's still the most expensive saddle I have ever bought and I'm planning on trading it in! Thankfully I got him back on his feet before he tried to turn himself over - Phew! We remounted and set off up the rocky trail, which led to the woods and the fields just at the back of the Farm. Both horses knew they were near home, and both were rushing, but again, I didn't feel out of control. However, once we got to the top of the hill and turned onto the trail home, Aero got silly. All of a sudden, Doug the Dog, who had been just another companion up to now, became the Vampire Attack Dog Who Lurks in the Woods. I had a short spell of spooking and cantering sideways, which wasn't very nice, but we got ourselves sorted out and carried on. Coming through the woods back into the Farm, though, he got silly again. After sitting another spook and sideways cantering spell, I decided to dismount once he had settled and lead him the last bit. He was still quite jumpy, but we made it back in one piece. Although I didn't come close to falling off either time he spooked, I did lose my balance a wee bit, that Isabelle Werth saddle was definitely not designed for trekking! A nasty horse would have sent me flying as soon he felt my lack of balance, but thankfully, Aero didn't, he just carried on going sideways/rushing after Quieto. I'm putting this bit of silliness down to a form of nappiness. He's still very insecure in his new rôle as Trekking Horse in France for the Elderly, but the Farm is now a place of security to him, which is why he's rushing to get back there every time. I know this will improve, as we never had this issue with him before, it's just a matter of him becoming familiar with all these new things I'm asking him to do. All in all, a great ride, 8.4km in two hours (not counting the faffing around with boots time). On Sunday, the plan is for the three of us to ride down to Reillanne with MC, then the LSH and I will make our way back to the farm on our own. But I'd better bring the Renegade Emergency Repair Kit, this time. Flurry's left hind boot (Renegade) came off with cables pulled loose. Cavallo Sport boots were not on long enough to make any judgement about them. Aero's Renegades stayed on and did not rub for the whole trip - this is by far the longest ride he has done with them. Aero's breast-plate is essential, I could actually see it holding the saddle in place any time we were climbing, we should probably use one on Flurry, too. Aero's numnah slipped right back twice and had to be reseated. I may have to swap it for one with loops when trekking. I've stopped using the YD's old GPA helmet, because every time I duck under a branch it "falls off" until the chin-strap stops it. This was my first day riding with the YD's Champion Skull Cap, and it sits much more securely on my head. When I think about it, the GPA is about ten years old and the padding is well packed down with years of sweat and grime - ick. Definitely time to retire it. Remember to pack emergency kits into the saddlebags in future. All in all not a bad ride considering the few mishaps. Beautiful country to ride through. I'm sure he'll settle down soon. I like Quieto he's a great role model. Have fun on your next ride. That is quite an eventful trek! I am so glad you got him up before he rolled on the saddle! Whew, I know just how upsetting a broken saddle can be. In fairness, I have never seen a saddle as completely wrecked a yours was! I've though that too, Annette, as I read of your adventures with Winston. We are following very similar paths, half a world apart.